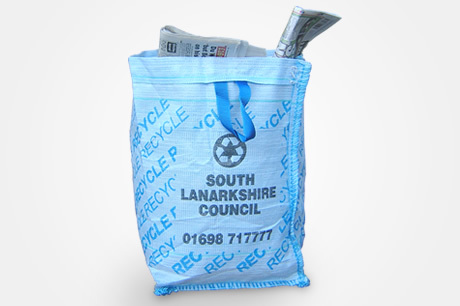 Our Kerbside Collection Sacks are ideal for collecting newspapers, cardboard, cans, glass or plastics and for transporting recyclables to recycling facilities. 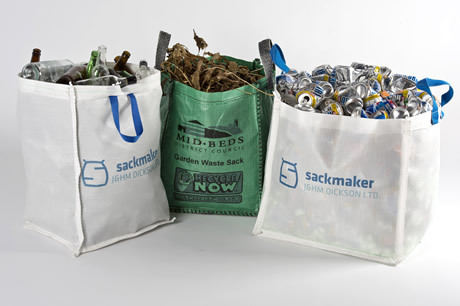 Sackmaker pioneered, design & manufactured the first Kerbside Sacks over 30 years ago - our Heavy duty, UV resistant, no nonsense, Woven Polypropylene bags have high abrasion resistance & are made from Virgin materials designed to last for years, not months. Made to a size that suits your application & printed with your details and user instructions. Our kerbside sacks are an alternative to boxes at a much lower price and are made from virgin grade UV stable material which is why they last longer than the rest - our sustainable products benefit the environments & are far cheaper in the long run. We can even supply them with reusable rubber Anchor Pads in the base so they stay put when empty. All our Kerbside Collection Sacks are 100% recyclable.